I use Google Chrome as my primary web browser, and not long ago I came across something I could do with Chrome that I thought was pretty cool. And sometimes even useful. Practically since the beginning of time, computer users have known about the keyboard combination CTRL + ALT + Delete. If your computer has a problem, or a window freezes, or just about anything, that’s what you try (or used to try anyway). That 3-key combination had the nickname – it was called the “3 Finger Salute”. Usually, when you click CTRL + ALT + Delete, you then clicked on “Start Task Manager” to show a list of the processes running on the computer. You could find the one that froze up in that list, then click on it to close it so that you could use your computer again. It was just quicker than doing a full power down and starting up again (especially in the old days when computers would take forever to finish booting up). What a lot of people don’t know is that you can get directly to the Windows Task Manager without doing the CTRL + ALT + Delete key combination. All you have to do is hit CTRL + Shift + Escape. And there it is, Windows Task Manager right in front of you immediately. Look at that, I just saved you that extra click and added years of productivity to your life. 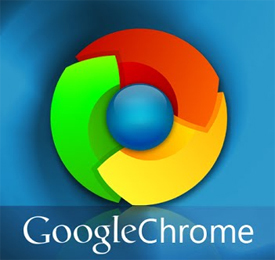 Now, back to Google Chrome. 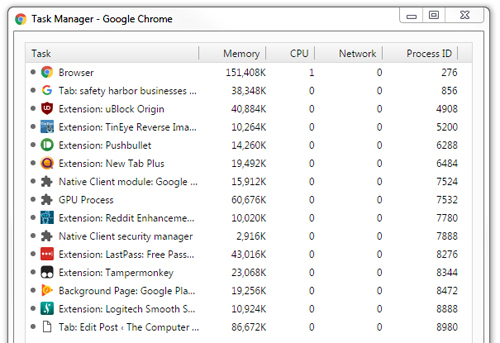 It actually looks almost identical to the Windows Task Manager, but this one ONLY shows the various tabs, extensions and processes that are active inside of Chrome at the moment. So if one particular tab is not working right (like when a web page freezes up) and you can’t close it, you can close it from this window. Or if you want to temporarily disable an extension, you can do that from here as well. 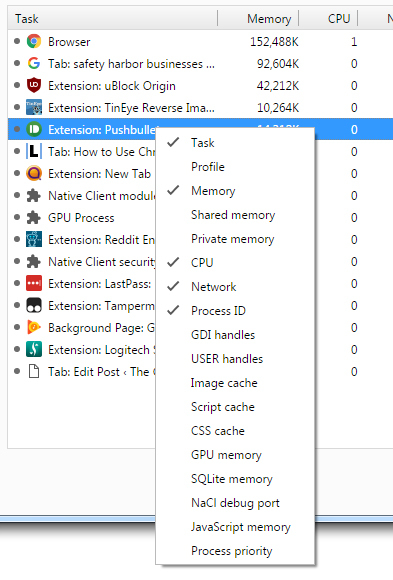 Just highlight the tab or extension, and click “End Process” – just like you would in Windows Task Manager. Chances are most users are not going to have a need to dig that deep into the recesses of Chrome to find out what the CSS cache is for a particular running extension. But should you ever have a need for that, it’s there, ready and waiting for you! In Windows 10, an even easier way to bring up Task Manager is to right click on the bottom taskbar and then click on Task Manager in the pop up. So don’t even have to let go of the mouse or push any keys. Happy 4th. If you have a weak old PC (like me), do not use Chrome (etc) as the Google update process can make your PC so slow, that you will be convinced that you have a virus. The first time that happened I rolled back to an image 5 days old (which meant a lot of file saving before I discarded those 5 days). The 2nd time it happened, I used Task manager to narrow down the cause. Removing all things Google was not easy, but I succeeded. There will never be Chrome (or Google Earth, etc) on my old XP PC. PPS I was going to mention the right click of the Taskbar, but Moe beat me to it. Rob, if you’re still actually using XP on a computer that accesses the internet, your choice of web browser is the least of your concerns. Great tip! And it WORKS! I’ve had lots of difficulty with one of my computers freezing up recently. Using this tip I realized why and was able to end the process! Sooooo enjoy your Monday morning Computer Tips…have for years! Just recently used the Photo Editing tip…I took hundreds of pictures recently and there was no way I could individually name them all…therefore I used your tip to name all the pics at once! It’s in a special quick reference on my phone! THANKS for your work! Thats a cool way to deal with all of my Chrome tabs I constantly seem to have open!! Very nice. I like you. I like Chrome.